It’s…ANOTHER THUMBPRINT COOKIE! Why? Oh, well, they are rather fun to make, plus they look attractive. This is based off of a recipe from Food & Wine (don’t know the issue, but it is online). I was so excited because the issue was about Christmas cookies, and I LOVE CHRISTMAS COOKIE SEASON. It is basically an excuse to see how many cookies I can turn out in a week – last year, I think it was something like 500. Anyway, these have a chocolate mint base and are filled with a white-chocolate mint ganache. They are really quite rich, so you cannot eat too many of them (I overdosed myself on white chocolate-mint truffles a few years back – I advise you to avoid this!). 1. Melt together the bittersweet and mint chocolates in a double boiler. Meanwhile, whisk together the flour, salt and cocoa powder in a medium bowl. 2. In a large bowl, beat the butter until creamy. Add the granulated and brown sugars, and beat until light and fluffy, 2-3 minutes. Beat in the egg yolks and vanilla until well-blended, then beat in the chocolate until just mixed. Slowly add the flour mixture and beat until smooth. Shape the dough into a disk, wrap in plastic and refrigerate at least 1 hour. 3. Preheat the oven to 350° and line 2 cookie sheets with parchment paper. Pour the coarse sugar in a shallow bowl. 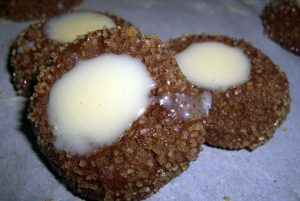 Scoop up tablespoons of the dough and roll them into balls, then roll in the coarse sugar and place on the baking sheets. Using your thumb, make an indentation in the centre of each ball. Bake the cookies for 10 minutes; remove the cookie sheets from the oven. Using your thumb, press into the cookies again. Return the cookies to the oven and bake for 5 minutes longer. Transfer the cookies on the sheets to wire racks to cook completely. 4. In a double boiler, melt the white chocolate. Remove from heat and whisk in the heavy cream and mint extract. Pour some ganache in the centre of each cookie and transfer to the refrigerator to set.